A lot of us enjoy those types of games in which we can just create our own experience by designing everything from scratch. Minecraft had a great success in providing us with such a thing, and now with Landmark we have the opportunity to take things to the next level. Now in closed beta, Landmark is offering us countless possibilities to claim and design your own place according to your own imagination. The game world is persistent which means that once you claim a piece of land it will be yours as long as you pay the daily upkeep. There isn’t any story in Landmark, as the game has been created as a building tool for the upcoming Everquest Next title. It was even called Everquest Next Landmark until the closed beta period. Once you start Landmark you will have the opportunity to create your own character. I have to say that the character creation process is a little scarce, as you can’t modify that many things in regards to the way your character looks. 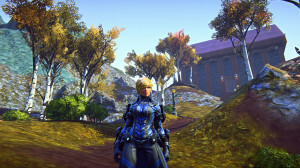 It’s good enough for the normal MMO player, but if you want in-depth character customization you won’t find that here, as you can change only the face, skin tone, hair as well as hair/eye color. You can choose to play on one of the multiple servers and the interesting thing here is that even if you are playing on a certain world, you can go to the central point on the map and teleport to other worlds on the spot. Not that many MMOs come with such a feature, and in the case of Landmark this does a lot of good because you can manage your claims a lot easier, even if you spread them on multiple servers. Once you are logged in a certain world, you can start exploring it. It’s recommended though that before you do that you get some items from the Portal Spire. Here you can find the Outfitter Table, Alchemist station and some other tables that can provide you with some of the items you need in your exploration. It’s also important to equip yourself with a weapon. Yes, even if Landmark was designed as a building game at first, now you can engage in PVP. The weapons can be acquired from the Stone Forge free of charge, which is really nice. In order to craft most of the items available in the Spire area you will need lots of materials that can be gotten through mining. However, you can’t go far into the world of Landmark without claiming your own section of land. The whole claiming mechanic is cleverly designed because you need to craft a claim flag in the Spire and then place it anywhere you see fit in the game world. However, the interesting thing here is that you can also claim adjacent pieces of land and create massive buildings according to your own will. You can build anything you want in your own claimed area, but for that you need lots of materials. Yes, a lot of them. I found the mining section of Landmark to be one of the fun things to do in the game. There are lots of materials scattered all throughout the land and trying to get the ones you need is really important. Once you claim an area you can use the gathered materials to craft your own tables, which diminishes the amount of traveling you need to do. Moreover, you have a wide range of biomes in Landmark, most of them included within the same map, so it’s really fun to explore all regions. You can explore deserts, forests and some maps even have areas covered with snow which in my eyes expands the experience and makes it much more complete. Gameplay-wise, Landmark is very engaging, because you always feel the need to explore more in order to find areas that might contain the items you need. There are lots of material types to be acquired, from copper to ore, wood, precious minerals, plants, gold and so on. I found the inventory system to be really good, as you are restricted to a certain weight so you can’t carry anything you find. You can easily delete the items you don’t want which immediately makes room in your inventory. Additionally, browsing through the materials you gathered is very easy. Combat, specifically PVP has been added recently to the game and it really shines. For the moment you can engage in 3 types of PVP matches, which can be either team deathmatch (which are by far the most fun), zone control or the simple deathmatch. For the moment there are only 3 weapon types which you can get for free from the Spire, and these are the sword, bow or wand. All of these are basic and most probably will be replaced with better weapons, but they are fun to use in combat, although it does take some time to get accustomed to the shooting mechanics which are variable for each item. All three have a basic attack which you can start with the left click and a power attack accessible with the right click. I have no doubt that the combat mechanics will improve in the future, especially since the developers want to add PVE as well as improve the PVP. Graphically, Landmark isn’t the prettiest MMO you are going to play, but the voxel graphics do provide a stunning place to visit. The various landscapes provide you with lots of opportunities, and all of them are carefully designed. The animations in the game are very good, despite the title being in beta. Jumping, sliding or climbing is very nice to perform and visually impressive. Characters are also quite detailed, which I really like, and overall the game does look great from a visual standpoint. Music in Landmark is really cute, as it is mainly comprised of background songs that do provide a soothing g atmosphere. Aside from that and the sounds made by weapons/pickaxes you can’t really hear that much in the game. This is not a problem though, because most that play Landmark want a relaxing building experience, and they are definitely getting it here. As you can see, Landmark is quite an impressive game with tons of potential. The title certainly came a long way from its alpha phase and now, with the addition of PVP, death, combat mode UI, proximity mines and some other interesting stuff the title is shaping up to become a very appealing title. Yes, it might have a very long way to go, but on the other hand the title is more than playable even in this phase. We like the fact that you can choose to be a part of the PVP experience or ignore it totally, it’s up to you. This basically means that you can create your own experience and play the game at your own pace, which is literally what people do want from a building MMO. In the end, the game does come with its fair share of problems, such as frequent crashes (it crashed literally every 30 minutes in my gameplay sessions), some missing textures and a camera that just goes wild especially when you are mining. Despite that, I found the whole Landmark experience to be enjoyable and quite rewarding. You can build anything you want, how you want it, without any restrictions. Yes, you do need to gather a huge amount of resources and engage in exploration, but in the end this is what makes the game experience worthwhile. I had a lot of fun playing the game and I certainly recommend it to anyone that wants a great MMO where building is the key factor. About the author: The review above was written by Don. Editor’s Note: Below is the review of the alpha version. It was revised on September 10, 2014 based on some feedback. 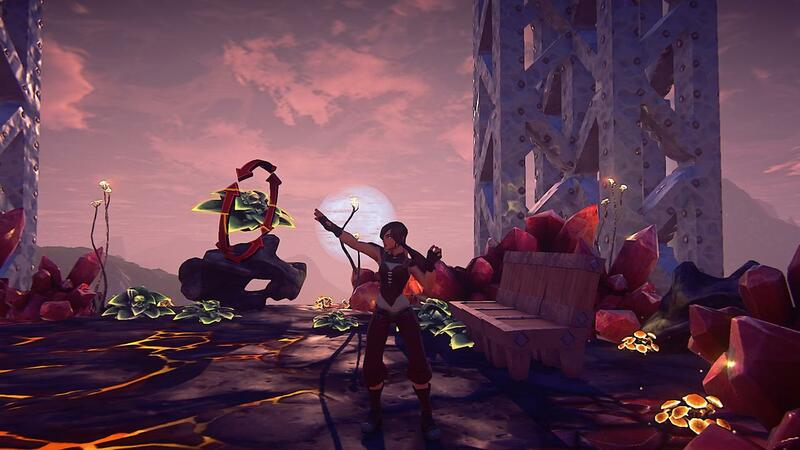 Everquest Next is an ambitious project that seeks to revolutionize the way MMORPGs are played. 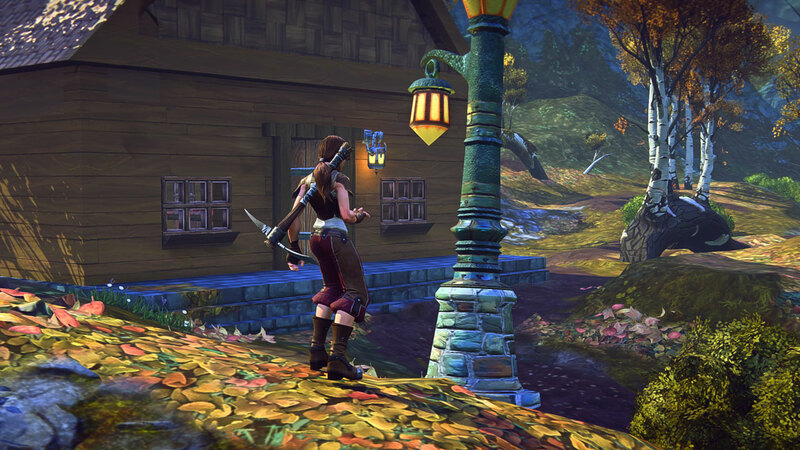 Offering the players a completely destructible world, EQN: Landmark is an open world Sandbox MMORPG. Everything you could imagine is 3D in this game, even the map! Landmark allows you to be able to help the dev team create the buildings and towns that will be in the EQNext game itself. Upon character creation you have a few options to customize you character with. There are a few different options for face/hair and body choices. There are several outfits that you can craft and buy from others or NPC’s as well as some you start with as you progress some into the gameworld. Founders start with 1-3 outfits depending on which founder pack they own. In Landmark you can build anything you can imagine! With a set of state of the art tools, you have unprecedented controls over your creations. There’s a massive collection of materials, each with their own unique look, with realistic physics meaning how you build will influence what you build. From tents to skyscrapers and realistic landmarks, such as the Eifel Tower or Coliseums of Rome, you can build anything you can imagine. After the project of yours is finished in the block format, it will become voxel based and smooth out making it look very realistic in design. Landmark offers a massive world with many islands that are planned to be automatically generated as content is demanded by the player base. You can explore anywhere you desire, even other player’s claims if they allow it. You can also lay claim to your own section of land using the claim flags that you get as you progress. As you explore, you’ll gather many materials that can be used to create crafting stations and much more. See what other players have built, or even help them build, and you can even build an empire with your friends. Claims will eventually have the option to expand and create even bigger projects with unique appearances even preset buildings purchased from other players. This will give players a massive zone to build on and earn real cash by selling their projects to other players using the Player Studio. Landmark is your chance to help build a game in all literacy of the phrase. You can build alone or in groups to create your own Landmarks such as pyramids or even massive statues of yourself. 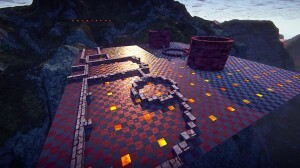 Join massive construction contests and your creations could last forever. The best buildings players create will become permanent fixtures in the EverQuest Next world. Landmark is definitely for the creative crowd! From the rarest resources, objects, gear, and secrets, all scattered across the worlds of Landmark, can you find everything? With a unique collection system, worry not about the amount of weight you’re carrying. The materials have no weight and you can collect 99,999 of almost every raw material. Objects can be used to change the look of the rooms you make inside buildings. Adding rugs or furniture help create a realistic feel to the home of your dreams. Perhaps you’d rather just make a never-ending winding staircase instead. One of the most unique features of Landmark is that you can actually buy other players’ work if you choose to instead of building your own. Players can also earn real cash by selling their projects and claims to other players at will. The only thing you need to succeed is creativity and designing skills! All buildings and claims can be blueprinted and sold, or bought, by or from other players using the Player Studio offered by SOE. Landmark is a separate game but is used in the creation of the EverQuest Next game. As time progresses and more creative players help design the game world’s structures the EQN project grows closer to playable status, Landmark is the building game for EQN and offers a variety of playstyles from PvP to humble builder, and in the future PvE content will exist as well. EQN Landmark is a great way to show off your skills in arctitecture, or how badly you can destroy the world around other players by mining it so it’s impassible. Eventually the landscape does return to normal if there’s no claim on it, so someone’s dirty work isn’t permanent. There is a great amount of customization and resources to create your own unique look that no other player can match unless you sell the blueprint. While in Landmark I felt like I was playing in an abandoned world, as the player base is spread out during this stage of development. The locations and game world itself is very beautiful and you can even change servers at any time you decide without losing your claim on other servers or having to remake your character. This is currently the only way to travel between the island worlds. However, there was word about them eventually trying to connect them into a massive world during the early stage of Alpha, but nothing has been said on this since. There are so many flaws in your review mate. I like the general tone of it, but there are so many false or outdated information. I think I could nitpick your review a bit more, but here are a few of the errors I came across. Not at all, but it will come. How do you figure? I have no idea how you came to that conclusion, I have 15 claims near the water and could easily find room for a couple of hundred more. Long time? Unless someone makes it their personal assignment to ruin the natural terrain around your claim, this is really not a problem at all. This is no longer true, once you put up your claim you get all available tools. When did you last log in? There has literally been made a shitload of props available by now, so unless you base this review on alpha experience, I disagree. There is a fixed amount of Islands that is not affected by the player base. You can? Not to my awareness. Simply not true. PVE Monsters coming to Landmark soon and PVP has been implemented recently. There will? Never heard that before! Seems like your review was made in alpha, would have rung true (for the most parts) at that time. This is the editor. Hmm, yes I believe this was during alpha but the review was late because it got lost in my email. I have changed the review to make that clearer. Landmark – the url is landmarkthegame but in all of their press releases and website content it is referred to only as Landmark. I will get in touch with the reviewer to ask about the other errors you cited. Best to scrap it and start again, even if it was written during alpha it’s still poor. I’m left wondering if the author has played the game at all, and frankly amazed at how poor their general gaming knowledge is. Add to that how badly written and presented the article is and I’m astonished it was ever published. I already tried to contact another person to do a review. Interested? Unfortunately I am engaged elsewhere. This was an alpha based review. I have given some revised responses to that and offered to remake it with more up to date information. There has been a lot that has changed since this was written. The game is not that impressive honestly. Ask a Trail Blazer who paid 100.00 dollars to have alpha access get the cool items to only have them changed 3 times by the internal development. They should have not offered these items or promises. They have scraped the crafting system 3 times. They sold us on the idea it would be for everyone crafter, explorer, adventure etc. They should have warned players and would be buyers that this was going to be heavily tested content and things would be removed or changed for the purpose of Ever Quest Next. Brydes comments are unfair as numerous people were having crashing issues. The game needed several optimizations before it finally got stabilized. Bryde is also one of the dev team favorites as he is highly skilled using the building tools. The game has gone thru 3 radical changes since its release and the upcoming update has driven a lot of player crafters away as there is not much to craft anymore. Also the design is now forcing players to build soon as they enter the game as they created tutorials into the achievement system for this. I played since alpha and not looking to the radical crafting and harvesting changes this next update. This article was a fair review of the game from an alpha to closed beta stand point. Bryde should be willing to accept the truth but those in the development inner circle seem to hate or despise critical reviews of the games state or will quickly shut down a player who has a critical review of a system or change to the games development.